It is with sadness that I learned of the death of best-selling author Aaron Allston on February 27, 2014. 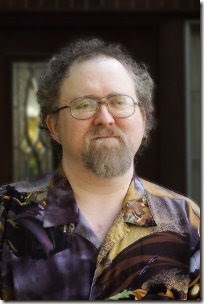 Aaron was an accomplished game designer and author. He’s known for having written a number of Star Wars novels, and several original novels. I first met Aaron at the Origins Game Fair in Columbus some years ago. I had some time between games and decided to sit in on a writing seminar, hoping to pick up some pointers. This became the first of many times I sat down to learn from him. Aaron taught me (and a roomful of others) how to analyze our story plots for weaknesses by making sure each scene in our story did something to advance it. He showed us how, when our fiction works properly, it’s a vicarious experience for our readers. He taught us about writing good descriptions, setting the right mood in our stories, and much more. I considered Aaron a mentor. I doubt he would agree, as we only exchanged perhaps five emails and spoke perhaps a couple of times at conventions. When I am discouraged about the quality of my work, I’m reminded of a story he told in one of his writing seminars. If you set out to be a carpenter, having never done it before, and you tried to build a chest of drawers, there is a good chance that the finished product would look nothing like the image you had in your mind. In fact, it would probably fall down the first time you tried to put a pair of socks in it. But that’s OK. You’ll build another, and it will be a little better. The next will be better still. Eventually, you’ll reach a level of craft in your woodworking that you’re able to start adding little flourishes, like carved accents and legs. So it is with writing. Your first novels are likely to be terrible. Later, they’ll get better. Someday, as your skill grows, you’ll be writing books you never thought you could. Despite Aaron’s good advice and teaching, I think I’m still in that “terrible” range… but I am seeing improvement. An mistakenly-addressed email wound up with me becoming an advance reader for Aaron’s book Plotting: A Novelist’s Workout Guide. In it, Aaron traces the development of a theoretical novel about a man who becomes a monster that preys on his own family. Reading the book is like sitting on Aaron’s shoulder as he worked, and being able to look inside his mind and see what he’s thinking, what he’s doing, and why. If you’ve ever wondered what that might be like, get that book. I had been looking forward to being an advance reader for other books he’d write. More than that, I’d hoped one day to offer him the chance to read something of mine. Alas, those dreams die with him. Aaron was more than just a good teacher. He was an author who practiced the things he taught. His novel Doc Sidhe came alive in my mind’s eye in a way few books do. I could visualize the crossing of universes, the strange cities and vehicles on the other side, and the strange magic and technology. I will need to re-read that book a few times, because I know he’s left a few more lessons inside for me. I will do my best to learn them. If you’re out there somewhere, Aaron, I want you to know that I appreciate all you’ve done for me. I hope someday to write a book that makes you proud. Godspeed, sir, and I hope the journey ahead for you is the best one ever. In his day job, Michael Salsbury helps administer over 1,800 Windows desktop computers for a Central Ohio non-profit. When he's not working, he's writing, blogging, podcasting, home brewing, or playing "warm furniture" to his two Bengal cats. By day, Mike Salsbury helps to administer over 1,800 Windows desktop computers for a Central Ohio non-profit organization. The rest of the time, he's writing, blogging, podcasting, homebewing, hanging out with friends and family, or playing "warm furniture" for two Bengal housecats named Bogey and Londo.